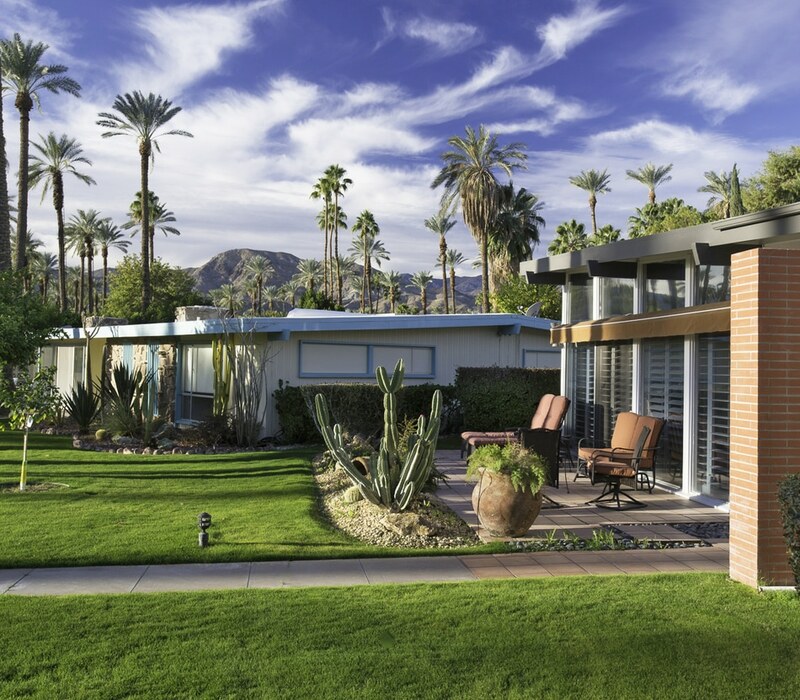 With Modernism Week 2016 fast approaching, fans are looking for new places to visit. 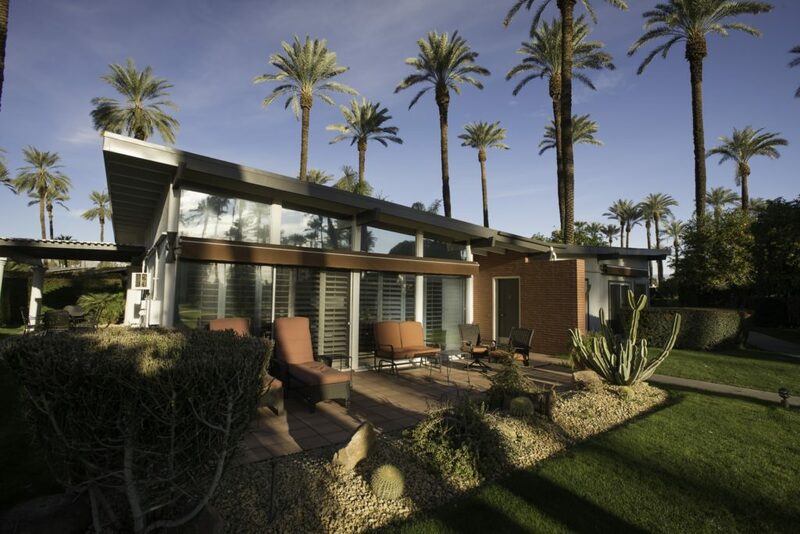 The City of Rancho Mirage is also a Modernism Week sponsor. Rancho Mirage became a hub of modernist architecture with the development in the mid 1950s of Thunderbird and Tamarisk Country Clubs. Both became the focus of architectural innovation. As the rich and famous flocked further east, so their architects came with them: Cody, Krisel, Williams, Wexler, Lapham, Welton Becket, Pereira, and more designed houses here, while smaller condominium communities were also developed. Tamarisk Ranchos (1958) is a community of 16 individual and unique homes, originally master-planned by famed architect William Krisel and built by Lou Halper’s Devon Construction. 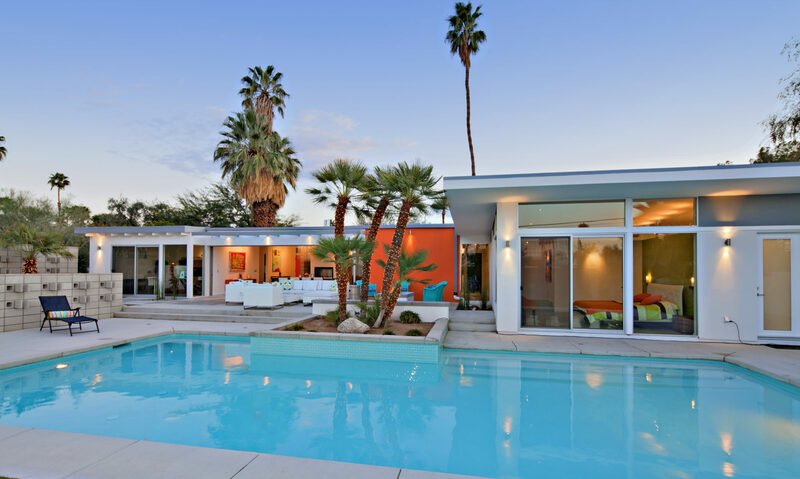 It hosted its first Modernism Week tours in 2015 and is welcoming visitors again on February 20th and 21st. Tickets are $65 with admittance into seven homes. The community is scheduled to receive ‘historic district status’ early in 2016. Event details. Homes feature butterfly roofs, clerestory windows, rock fireplaces, and other fascinating details. Halper was the developer and a founder member of nearby Tamarisk Country Club. Tamarisk Ranchos was designed for entertaining, with homes gathered around a central pool and community gardens. Residents included Halper himself, Groucho Marx, Al Hart (Sinatra’s banker, founder of City National Bank), Dr Leon Krohn (Sinatra’s physician), Lawrence Weingarten (legendary Hollywood producer for ‘Cat on a Hot Tin Roof’), and Jules Goldstone (Liz Taylor’s agent). 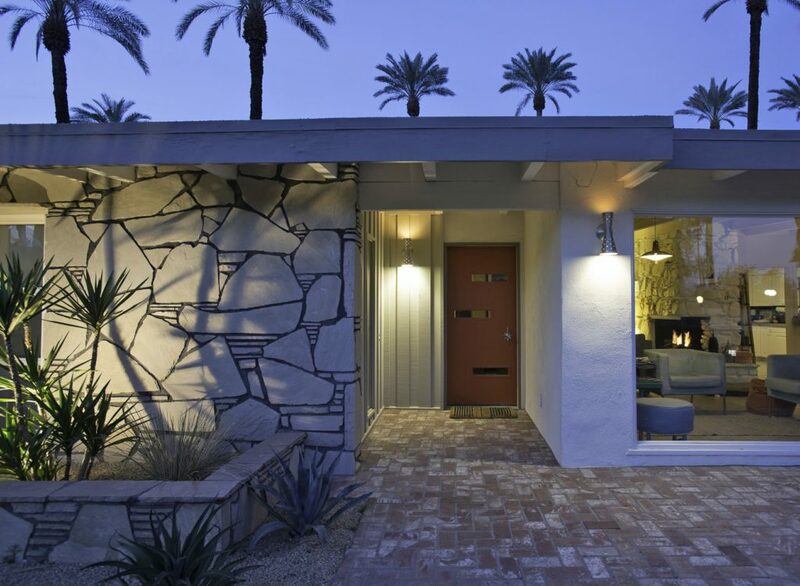 New for Modernism Week in 2016 are the homes at ‘Cody Court’ – the William Cody-designed cluster of eight homes on the 10th fairway of Tamarisk Country Club. Designed in the late 1960s in Cody’s classic style, homes feature floor-to-ceiling-glass, deep overhangs, and atriums surrounded by living spaces. Five homes are open on Saturday February 20th and Sunday February 21st. Tickets are $50. Event details. William F. Cody’s legacy will be discussed in a ‘moderated conversation’ to be held at Rancho Mirage Public Library on Tuesday, Feb. 16th at 2pm. Admission Free. Architecture experts will be Professor Emily Bills (New School, NY) and Professor Don Choi (Cal Poly, San Luis Obispo, where Cody’s archive is kept), Jo Lauria, curator of an upcoming LA exhibit on Cody, and Catherine Cody, daughter of the architect and an architectural researcher. Rancho Mirage is best known for ‘Sunnylands’ by A. Quincy Jones, now even more famous following frequent stays by President Obama – who will host another meeting there on February 15th and 16th. 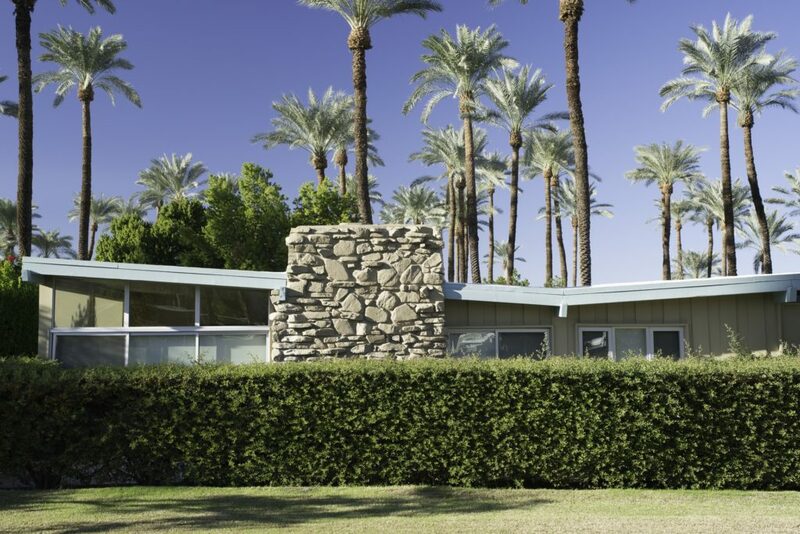 Tickets for Sunnylands during Modernism Week are already sold out. ‘Modern Giants’ at Eisenhower Medical Center on Saturday, Feb. 13th, 11am, is billed as ‘lectures, a luxury guided tour, a book launch, cocktails, and cuisine’ all for $25. Event details. Eisenhower Medical Center is renowned for its medical facilities, but its campus includes buildings by Edward Durell Stone, E. Stewart Williams, Donald Wexler, and more, making it the ‘largest midcentury modern commercial collection’ in the valley. Greetings… we’re a gallery from N Utah coming down for the Palm Springs Fine Art Fair in a couple weeks, and we’re looking to connect with folks who can help us get the word out about our fantabulous artists, several of whom make work which is sure to please the midcentury / modernist crowd. and if something catches your editorial eye, we’d be happy to provide more/better info & images.